Originally Uralla was part of the Parish of Armidale, and was set in a growing gold mining district from 1852. 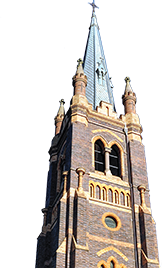 The spiritual needs of the congregation were cared for by the priests of Armidale. After a parish meeting 1885 the approach was made to Mary MacKillop who left the negotiations to the NSW Provincial for the Sisters of St Joseph to establish a Catholic parochial school in Uralla. Within a month the foundation stone of the convent was laid by Bishop Torreggiani, assisted by Dean PJ O’Connor.